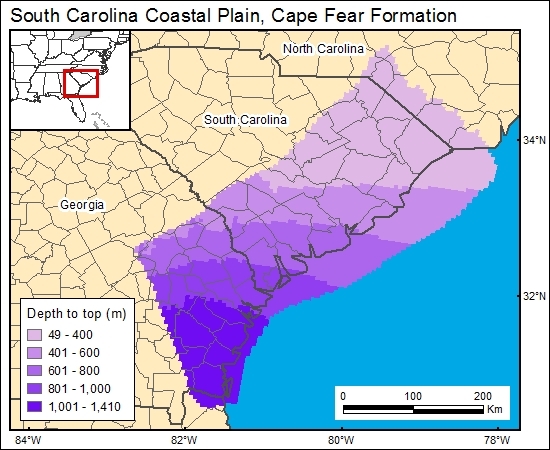 A number of maps show the elevation at the top of the Cape Fear Formation (Brown and others, 1979; Colquhoun and others, 1983; Aucott and others, 1987; Renkin and others, 1989; Miller, 1990). We chose to use the maps of Renkin and others (1989) because they provided a detailed, regional map of the top of the Cape Fear aquifer, and they clearly documented the stratigraphic position of the top of the unit. We then used a DEM generated from Digital Terrain Elevation Data (National Imagery and Mapping Agency, 2000) to calculate and grid (c1capefear) the depth to top of the Cape Fear brine formation.